In 1901 the family lived at Hartley, Kirkby Stephen in east Westmorland where 36 year old William worked as a farmer. By 1911, the family lived at Worsall Grange, Yarm, North Yorkshire where William was employed as “cowman” and 14 year old William was recoded as “milk cart driving”. Presumably by the outbreak of war, the family members were working in the West Auckland area since William and Mary lived at 136 Front Street, West Auckland. The service record of Private William Armstrong and the war diary of the 1/Leinster Regiment have not been researched. William Armstrong enlisted at Bishop Auckland, formerly 9319 Training Reserve Battalion. At some time later he was transferred to the Leinster Regiment and was allocated the regimental number 5767. 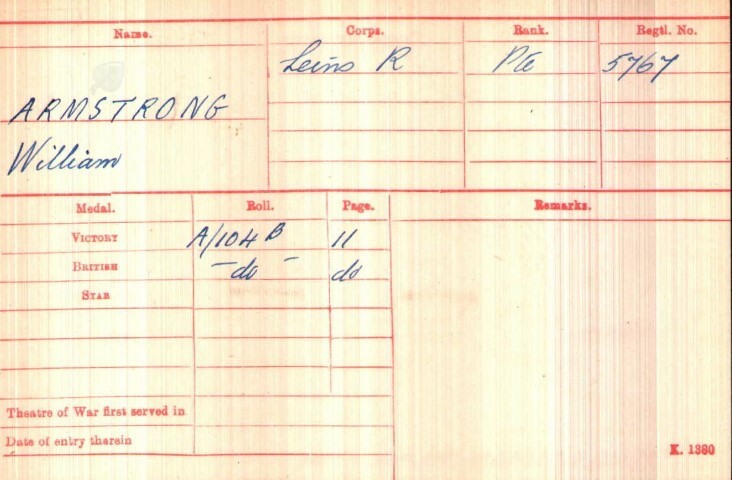 Private W. Armstrong did not enter a theatre abroad until after 1 January 1916. He possibly entered Salonika with his battalion in November 1916. Some Greek factions, including King Constantine, were pro-German. The outcome of the Gallipoli campaign was in the balance and most shipping in the area was involved so they really had no choice. 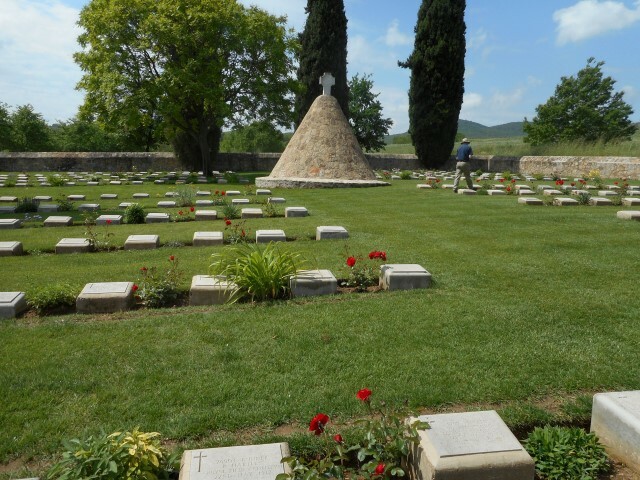 In December 1915 the British element fought a battle at Kosturino, north of Lake Doiran, after withdrawing from Serbia. After this there was little action except for occasional air-raids on Salonika. During the first four months of 1916 the British Salonika Force had enough spadework to last it for the rest of its life. Large amounts of barbed wire were used and a bastion about eight miles north of the city was created connecting with the Vardar marshes to the west, and the lake defences of Langaza and Beshik to the east, and so to the Gulf of Orfano and the Aegean Sea. This area was known as the ‘Birdcage’ on account of the quantity of wire used. The Bulgarians and Austrians also fortified the heights of the hills surrounding Salonika during the same time which had dire consequences later on. The original two Brigades eventually were reinforced by larger units until 22nd, 26th, 27th and 28th Divisions were there. If the Bulgarians had descended from their Doiran and Struma heights it would have been very difficult to “push us into the sea”, for the force was deployed to fortify an advanced defensive line. The Salonika Force dug-in until the summer of 1916, by which time the international force had been reinforced and joined by Serbian, Russian and Italian units. The Bulgarian attempt at invasion of Greece in July was repulsed near Lake Doiran. At the beginning of October 1916, the British in co-operation with her allies on other parts of the front, began operations on the River Struma towards Serres. The campaign was successful with the capture of the Rupell Pass and advances to within a few miles of Serres. During 1917 there was comparatively little activity on the British part of the front in Macedonia, due in part to complex political changes in Greece throughout the year. The main fighting took place around Lake Doiran, where the line was adjusted several times by each side early in the year. In April 1917, the British attacked, gained a considerable amount of ground and resisted strong counter-attacks. In May, the Bulgarians attacked the British positions, but were firmly repulsed. The British action in May triggered a series of attacks elsewhere on the front by the other Allies, known as the Battle of Vardar. But, between 1 November 1916 and 1 October 1917, there were 2 officers and 13 other ranks serving with 1/Leinsters who died which does not suggest heavy involvement with fighting. 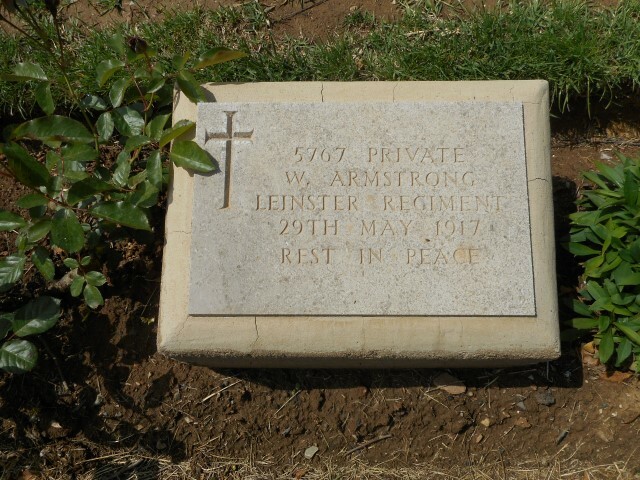 There were 5 deaths in May 1917, the month in which Private W. Armstrong was killed which was the highest number over the period researched. The circumstances of Private W. Armstrong’s death remain unknown. SDGW records that he was killed in action. It is possible that he was caught in a skirmish with the enemy or was subject to sniper activity. Private W. Armstrong was awarded the British War and Victory medals. Thanks to Martin Gibson, Alan Wakefield and members of the Salonika Campaign Society and Minas and his daughter for taking the time and trouble to photograph William Armstrong’s grave.